Agri-food exports exceeded €13bn in 2017, with half of the growth in new overseas sales coming from markets outside of Europe. The figure represents an increase on the 2016 value of food and drink exports of €11bn. Growth in exports to markets outside of Europe was led by a six-fold increase in exports to China between 2010 and 2016, according to the 'Prioritising Markets: Opportunities for Growth' report from Bord Bia. In addition to the strong growth in exports to China, there was a doubling in exports to the rest of Asia and North America, and a rise of 40pc in trade to the Middle East and Africa. The increase in exports to international markets will come as a relief to the agri-food industry, which is facing the possibility of being disproportionately impacted by a hard Brexit. 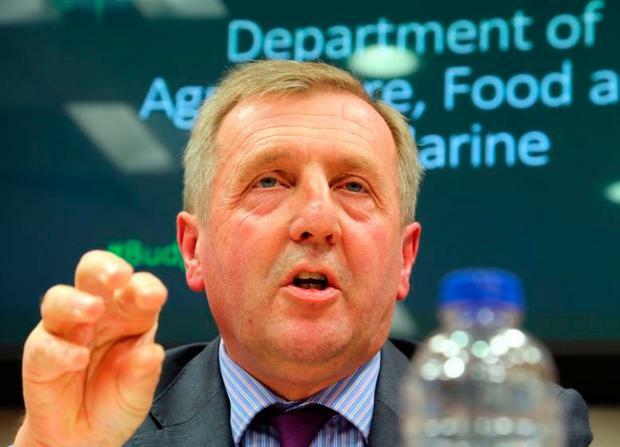 Commenting on the report, Minister for Agriculture Michael Creed said that "despite all of these successes, we must, in light of Brexit, intensify our efforts further and diversify into as many international markets as we can". The Minister's sentiments were echoed by Bord Bia chief executive Tara McCarthy, who said that Brexit has "created a new urgency around diversification for many exporters". If the growth trends evident between 2010 and 2016 continue, international markets [outside of Europe] will account for over 40pc of Irish food and drinks exports by 2025, Bord Bia said. Among the factors contributing to the growth in Irish food and drink exports abroad are a growth in global population, along with increased urbanisation and affluence. Looking at the results in more detail and over the past six years, the value of Irish dairy exports has increased by 11pc, while the value of beef exports is up by almost 50pc. Exports of cereals and cereal preparations are up 59pc, while seafood exports are up by 50pc. Sheep meat, which has seen its exports increase by 70pc in the past six years, has witnessed the biggest growth. Turning to beverages, in 2016 Irish beverage exports grew by 4pc to €1.4bn. The increase in exports is driven by increased demand for premium alcoholic beverages, which is in turn reflective of increases in the disposable income of consumers in many developing regions. Irish whiskey now accounts for 2pc of the global whiskey market, a figure that is expected to grow to 2.4pc by 2019, making Irish whiskey the fastest-growing spirit in the world, according to the report. In 2016, exports of Irish whiskey to North America alone increased by 17.4pc. However, Bord Bia has warned that protectionist measures threatened by the current US administration under President Donald Trump include levies applied to imported spirits. Such levies would have negative consequences for Irish whiskey exporters. The report also identified and analysed 15 top growth markets for food and drink exports over the next five to 10 years. Countries including Australia, Chile, China, Hong Kong, Iran and Japan are earmarked for meat exports, while China, Japan, Nigeria and Saudi Arabia are some of the countries dairy exports will be targeting. "The report provides insights to help Irish companies identify potential leads, better understand the needs and requirements of overseas customers and understand the mechanics of doing business in the market," Minister Creed said.